Ned Kelly – Folk Hero or Miscreant? | Beat Like Kerouac – now with child! 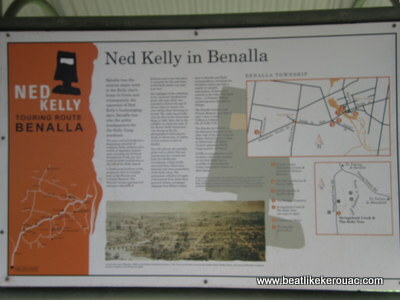 Here in my current area of residence (Northeast Victoria), Ned Kelly and his gang, comprising of a brother and a couple of friends, lived their dramatic and very well-documented last days. I know the details of these because the local population (and obviously a few tourists) are unbelievably obsessed with the life and times of Ned Kelly. It can be summed up like so: After a few years of robbin’ and killin’ then escaping into the bush with his pals time and time again, Ned Kelly’s number seemed to be up and the cops were on his tail for real. He and his gang were found to be hiding out in a pub in the little town of Glenrowan, about 15 minutes from our house, and police jumped a train to take care of things. In June of 1880, although telegraphy and outdoor photography were new, the standoff was so anticipated that operators of both were on hand, along with about 200 spectators, when the police train rolled into Glenrowan (hence the thousands of very detailed descriptions of the following). After a night-long standoff, Kelly himself emerged from the house in a very bizarre getup of handmade armour, which consisted of a breast plate covering his upper body and a helmet that resembled an upside down rubbish can. His lower body was exposed, so one of the cops shot him in the leg. (Duh). He staggered off into the woods and was captured, sent to jail in Melbourne, and then hanged. His last words were “Such is Life.” And that’s all I have to say about that. Just in case you want to do a driving tour! 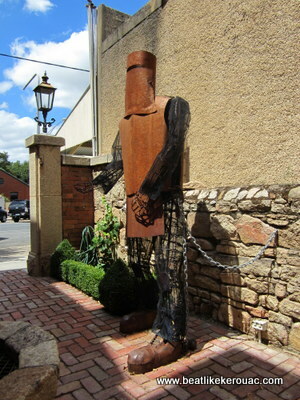 So, when the unsuspecting tourist visits Benalla and Glenrowan, he is overwhelmed with paintings, plaques, books, cartoon likenesses, statues made of a variety of materials, stuffed dolls, stubby holders, pencil cases, even costumes depicting Ned Kelly in his famously creepy rubbish bin helmet. Every information centre, gift shop, and pub in a string of small towns that have had the misfortune of being on the train line between Benalla and Wangaratta in 1880, seem to have a share in it. Bill Bryson, in his 1999 book “In a Sunburned Country” (or “Down Under” as it was published in Australia), gives a fantastic review of his Ned Kelly experience at the now world-famous theatre show, “Ned Kelly’s Last Stand,” which depicts the final siege through a series of animatronic dummies. TripAdvisor refers to it as “an expensive laugh,” as the entrance fee of $25 per person seemed a bit steep. The theatre is a series of rooms (the audience member is told when to get up and move on to the next) designed to look like an old saloon with dummies outlining the Kelly story (supposedly). “Dummies with a frozen smile and mop of hair resembling windblown pubis re-enact scenes from the Kelly shootout in a random, deliriously incoherent way.” The projected facial movements were out of synch with the narrative (which made no sense to me anyway). The scene was filled with jerky, random motion – dummies’ arms painfully moving up and down, trapdoors opening and closing for no apparent reason, the obligatory player piano, even a boy on a trapeze (?). I have never heard a truer statement than when Bryson says that he has never seen anything “as wonderfully, delightfully, monumentally BAD as Ned Kelly’s Last Stand.” It was so bad, it was worth every cent. Although very kitschy and somewhat entertaining (especially since I’d read Bryson’s review beforehand as sort of a warning, which was good), I didn’t really know any more about Ned Kelly when I left than I did when I went in. But if I was truly concerned with historical facts, I could read one of the 347 Ned Kelly books currently in publication and readily available at all libraries, bookstores, and historical centres in northeast Victoria. So why, I must ask, has a stupid thug like Ned Kelly gotten so much legendary attention, in the way of Al Capone, Tupac, or John Gotti? What is it about these particular criminals (but not terrorists or pickpockets) that give them story-worthy reputations in death? Is there some kind of Robin Hood mentality, of stealing from the oppressing rich and giving back to the little people? Stick’in it to the man! Or perhaps it’s easy to glorify someone who lived so long ago that the passage of time has allowed for increased fuzziness and inflation in the details of his life. Regardless, the anti-hero remains, and since every area has it’s own, I guess Ned Kelly is now mine, silly helmet and all. 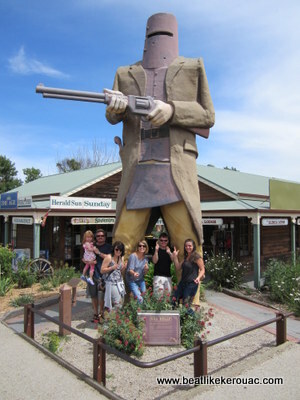 Gallery | This entry was posted in Australia, Australia, Culture, History, Philosophical, Travel and tagged Australian folk heros, bushrangers, Ned Kelly, north-east Victoria, travel. Bookmark the permalink.